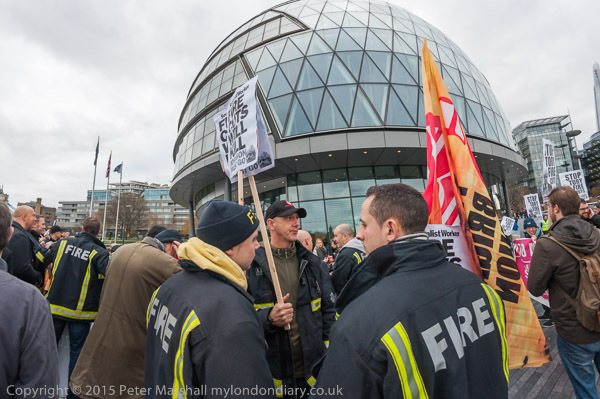 There wasn’t actually a fire at London’s City Hall, but there was certainly something of an emergency, with plans being debated that would cut 13 fire engines and 185 firefighters from the London force. Cuts already made by Mayor Boris Johnson have already led to an increase in response times, and the new cuts will further endanger Londoners. If you have a fire now in London, it will take longer for the firefighters to arrive, and you chances of being rescued from a blazing building have dropped. So you need to be very careful. Things can get worse, and if the current government remains in office they almost certainly will. 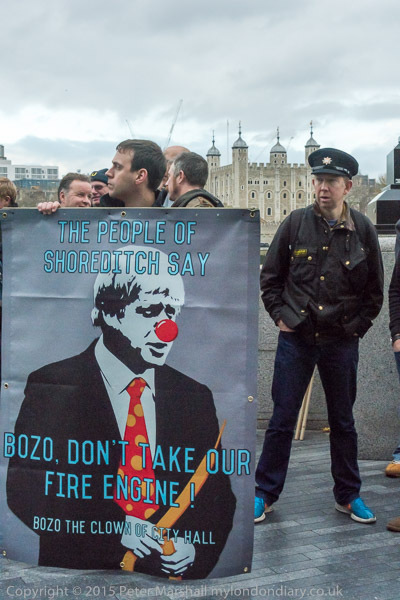 It can’t be long until the fire service gets privatised and we will all be at the mercy of G4S or Virgin Fire. And perhaps rather than a universal service we will go back to the days of ‘fire marks’ on buildings, and if you haven’t paid your insurance the firefighters will simply watch your house burn down. London no longer actually owns its City Hall; the oddly shaped mushroom which now houses the Mayor and London Assembly is only on a 25 year lease from its Kuwaiti owners, while London’s real City Hall, County Hall, diagonally across the river from the Houses of Parliament is a hotel and various tourist attractions, sold off after Mrs Thatcher decided London didn’t need an overall authority – one of her most disastrous and spiteful policies. Total madness. Back to the protest, it had as its backdrop not just that curiously shaped glass monstrosity (it does have some interesting features internally) but one of London’s most iconic symbols, Tower Bridge. Getting to use them in the pictures was rather less straightforward. We were too close to City Hall, and it needed the 16mm fisheye to show it in any sensible fashion – as in the top image (converted as usual to make the verticals straight using FisheyeHemi.) Tower Bridge on the other hand needed a slightly longer lens to make it prominent – the image above was taken at 32mm using the 16-35mm on the D700. 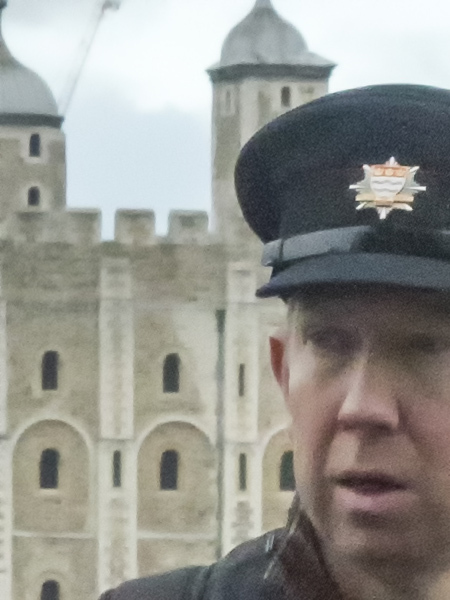 And using the 28-200mm at 40mm in DX mode – 60mm Equiv – I was also able to bring the Tower of London into the scene. It was a little unfortunate that when I took this I hadn’t spotted that I still had the D810 set a -4EV from some night images the previous evening, and the result is somewhat gritty. Unless you zoom in on the camera back the noise isn’t apparent, and images often look rather dark. I noticed the mistake a few frames later and did try to retake some images with the correct exposure, but photons never flow through the same lens twice in the same way. Perhaps the best result would be to set Dfine manually to perform a little less noise reduction rather than simply leaving it on Automatic. The full web size image above is without using Dfine. The image noise isn’t really objectionable, although the colour quality isn’t as good as if I’d given correct exposure. 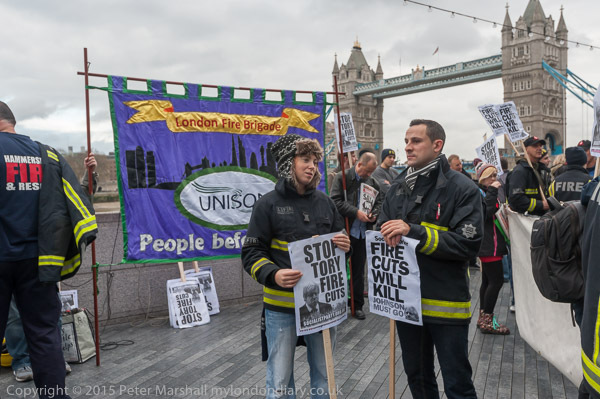 You can see more images from Firefighters say cuts endanger London on My London Diary – and you can see if you can find any other pictures that were exposed at -4EV. 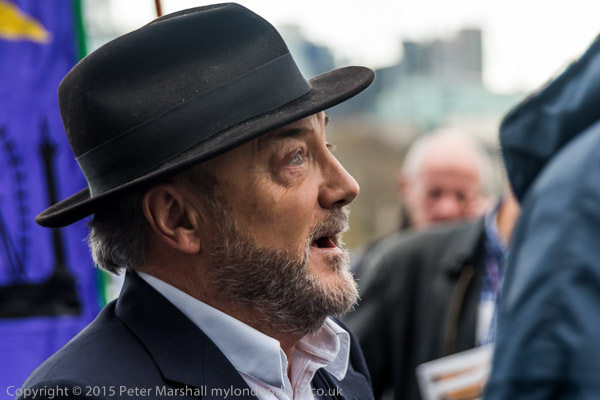 One person I’d not expected to be present was George Galloway, who was intending to stand as Respect Party candidate for mayor in 2016. He came seventh in the first round of voting, with 37,007 votes, 1.4% of the poll. At least he beat Britain First and the BNP. This entry was posted on Sunday, June 5th, 2016 at 06:31 pm and is filed under Uncategorised. You can follow any responses to this entry through the RSS 2.0 feed. You can leave a response, or trackback from your own site.